The Dominican Republic remains a top sun destination for Canadians, with 904,460 Canadians visiting the country in 2018, an increase of 7.4% over 2017. According to the Dominican Civil Aviation Board (JAC), one of the country’s busiest flight routes was Toronto to Punta Cana. Last year was a strong one for the DR as it welcomed more than 6.5 million passengers via air travel -- a 6.2% increase compared to 2017. And with several highly anticipated hotel openings and new projects from major international hospitality brands, 2019 is shaping up to be another big year. Marriott International is set to open three new luxury resorts to the Puerto Plata region -- a US$350 million project -- which may include a Ritz-Carlton and a W.
Hilton recently opened two new all-inclusive hotels in La Romana and the pending Club Med Miches, Playa Esmeralda has recently been included on Forbes Magazine’s list of most anticipated 2019 Caribbean properties. Targeting golf fans, world-renowned golfer Greg Norman is in the process of constructing his first Dominican golf course in Santo Domingo. The 18-hole track is set on 1.1 million square metres and is expected to open late this year. In another golf course project, the high-end Rio San Juan Golf Course at Playa Grande Golf & Ocean Club recently celebrated its grand opening with President Danilo Medina leading the ribbon-cutting ceremony. 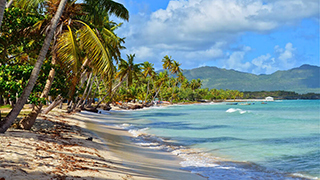 In cruise news, the Dominican Republic Port Authority recently announced a US$125 million cruise port is pending for 2020. The port will be able to handle 680,000 passengers per year and five cruise lines are already planning on having ships stop there, including Virgin Voyages’ Scarlet Lady which is scheduled to launch in 2020.